It’s definitely the style of the season, but the fringe is a timeless classic that you can transition from one part of the year to the next. We love it for layering in the winter too. 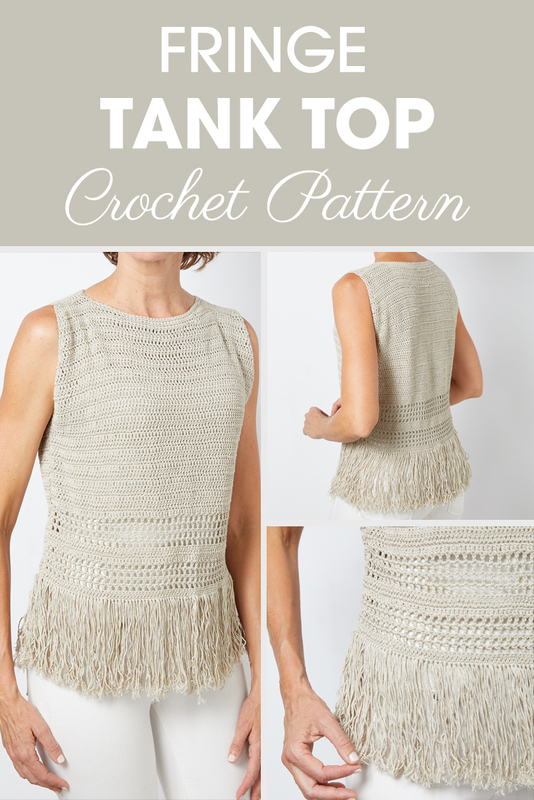 Since you can never have too much fringe in your life, it’s time to try this fringe tank top crochet pattern. This pattern uses the Erika Knight Studio Linen yarn in the color Bone. This yarn really is perfect for this pattern. If you’ve never used linen before then you’re in for a treat. The fiber absorbs moisture from the skin and gives it a really lovely cool, crisp feeling even on the hottest days.​​​​​ I can’t recommend this specific yarn enough for this project. I’m also really excited to share that we’ve decided to release a kit for this project. As with our last yarn kit, we have ​​partnered with local yarn stores to make this possible. 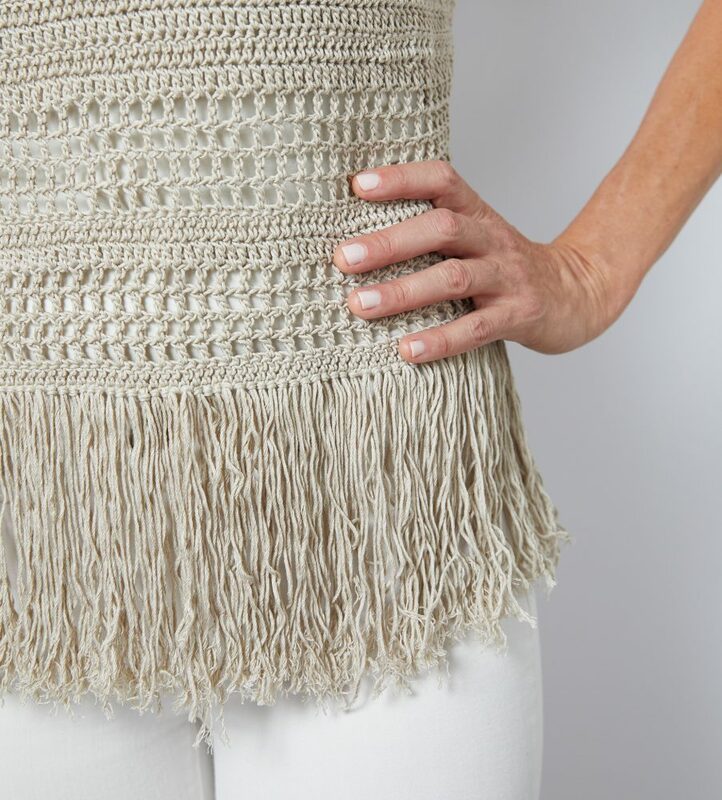 The kit has everything you need to make the Fringe Tank Top. Every kit includes the digital PDF pattern for the Fringe Tank Top, plus the yarn and supplies you need to bring it to life. For the next 24 hours you can purchase your kit here and save 10% off your order. We only have ten kits available so make sure to grab yours today. Plus you can feel good about your purchase because you’re supporting a small, local yarn shop owned by another maker who is passionate about crochet. I love supporting other makers, and it’s great to be a part of such an amazing community. Row 38: Ch2, dc2tog, make 24 dc. Count and mark out 26 st from other side. Sc from last dc to st marker, then make 24 dc, and one dc2tog in the last 2 st. Rows 39-40: Repeat row 38, decreasing on the first and last st of each row. Rows 41-45: Repeat row 38 without decreasing. Place right sides of fabric together, and whip stitch the top of the shoulders together only on the dc section. The sc section is left open as the neckline. Stitch the bottom 27 rows together, and turn right side out. Using the 8 inch cardboard square, wrap the yarn around the square 336 times (416 for m/l) and cut the bottom. Using two strings at a time, fold the ends together and pull a loop through the bottom of the fabric, then pull the tails through and pull snug. Repeat around. Why not show off what you made with your own two hands? Snap us a picture of your new super cute tank and we might just feature it. We’re so excited that you chose this pattern. And we know you’re going to want to start on another one now that you realized how much you love this one. We’ve got all the crochet patterns you need and more. Try some of these crochet blankets on for size. We are also on Instagram, follow us there for our latest patterns!